Curtin, E., Caron, J., Light, J., McNaughton, D. (2018, March). 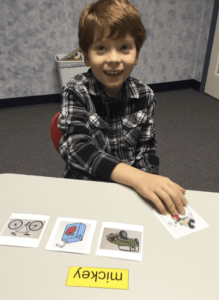 Grid-based AAC apps to support literacy: Case study with ASD. Poster Presentation at the 2018 Pennsylvania Speech-Language-Hearing Association (PSHA) Convention in Pittsburgh, PA.
Due to intrinsic and extrinsic challenges, many individuals with CCN and ASD are unable to read or write at grade level (Koppenhaver & Yoder, 1993; Foley & Wolter, 2010) and these reading deficits then persist through adolescence into adulthood. Although literacy instruction (including sight word instruction) is imperative, improved features within AAC technologies could also be used to complement instruction and infuse literacy learning into daily communication. There is an urgent need to better understand how design features in AAC systems can support improved literacy outcomes for individuals with complex communication needs.